Great Britain is an odd nation. Historically, we are perceived as walking around with our stiff upper lips, flipping a nonchalant middle finger in the face of adversity whilst taking a break for tea. ‘Keep Calm and Carry On’ is a famous old wartime slogan that has recently become a marketing phrase – adorning various products from t-shirts and pillowcases to mugs and bags. It has become so ubiquitous in fact, that I would not be surprised were it to turn up on sanitary towels or condoms. To be honest, I hate it, seeing the phrase makes me turn my nose up in spasm every time I see it. In short, it makes me anything but calm. But anyway, that’s not why I am writing this. I am writing because I believe that there are some instances that make Britons shed their calm, collected skin and instead turn into frothing, irrational idiots. An example of this came last week when one of our senior government ministers incorrectly predicted an imminent strike by petrol tanker drivers – which would, in turn, lead to a shortage of petrol. The minister, Francis Maude, said it would be advisable for people to hold an extra supply of petrol cans in their garage. Despite the safety risks associated with this, a considerable proportion of the British public rushed out to fill up their vehicles and excess containers before the supply ran dry for an indefinite period of time. The subsequent queues that formed outside petrol stations across the country were ridiculous. Of course, this panic proved unjustified as any strike was postponed and normality duly returned. Maude was undoubtedly an idiot for his comments, but a large number of the British public seemed to blame him for a serious accident that happened as a result of this, whereby a woman in York was left with 40% burns after trying to decant petrol into a container for her daughter. She did this in her kitchen – next to a lit cooker. Whilst a horrific thing to happen, the fury and blame that was directed towards Maude for this was absurd. Yes, he was foolish but he could clearly not be held responsible for such a careless act committed by someone else. The point is, that when us Britons do panic, we often panic totally unnecessarily and then look for someone to blame, usually at the time when we realize we have been a bit foolish. Another example of this is our response to snow. There were reports of an invasion by the white terror earlier this week and it partially became true. I was in Manchester due to work and Wednesday saw a considerable flurry where I was based. Reports on the news suggested that it was slowly making its way south and, inevitably, the obligatory advice followed. ‘Only undertake journeys if they are absolutely necessary’, ‘look in on elderly people to make sure they are ok’ and ‘don’t run around your garden naked whilst whistling the theme to ‘The Snowman’’ (I may have made the last one up). Attention turned to the airports even though no flights were due to be cancelled. Are the gritting trucks out yet? Have the council spent enough to make sure roads and paths are passable? Like the petrol, this turned out to be mostly a false alarm, albeit there were areas in Scotland and Northern England that did have a considerable amount of snow. 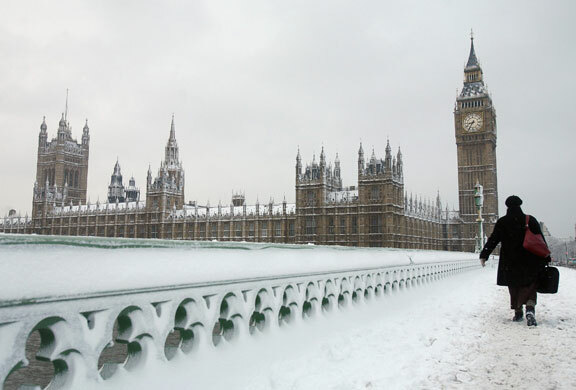 But this panic over snow has stemmed from the last 2-3 years, when Britain has had colder winters and periods of very heavy snowfall. During these periods, opinion tends to be divided. Some love the snow (myself included) and become almost childlike in their response to it, greeting any disruption with a shrug and a smile, hoping to enjoy it before it melts and turns to slush. Yet, the more vocal majority panic and blame. Like the petrol fiasco, a considerable number of people rush to the shops whenever snow is first mentioned, stock-piling as much food and as many ‘essentials’ as humanly possible in order to make it through the coming apocalypse. These same people are quick to point at the blame at the government for not planning effectively, criticising our infrastructure and transport for not being able to cope and pointing out that other countries are ‘laughing at us’ for effectively grinding to a halt due to a few inches of snow. ‘Canada/Sweden/Russia all seem to cope just fine with four times as much snow as we have had’ they cry. This may be true, but these countries have traditionally had more snow and are therefore better equipped to deal with it, being able to spend a lot more to alleviate the problem. Whilst the last 2-3 years have seen colder winters, heavy snowfall is not ‘the norm’ for us and therefore it is still something of a surprise and an oddity when it hits. Besides, if we were to spend millions on grit/salt/vehicles etc, the same people who complain about us not being prepared enough would be the same people who are complaining that we are turning into a ‘nanny state’ and throwing money away. It seems to be a no-win situation. Perhaps, in these extreme moments of panic, we tend to look at ourselves afterwards and, disliking what we see, hit out at those who we can pinpoint for blame, justified or not. Justifying it doesn’t matter as long as it diverts away from the fact that we have let our mask slip and behaved less than smartly. Of course, it’s not just potential lack of petrol and lots of snow that do this. In recent years we have panicked and blamed before, during and after the swine flu epidemic that was never anything near an epidemic at all. We have cursed an Icelandic volcano that disrupted travel plans and blamed those who run our travel industry for not having a proper contingency plan. Who knows what the next event will be – there is a hosepipe ban in some parts of the country at the moment so maybe that will escalate? Or maybe we will have to wait until the first snowfall of next winter? Either way, we end up with egg on our faces when we panic. If there is a way of panicking with dignity, we are not going to find it. So, when faced with potential reasons to panic, maybe we should just take a deep breath, keep calm and carry on. Oh crap – I said it.